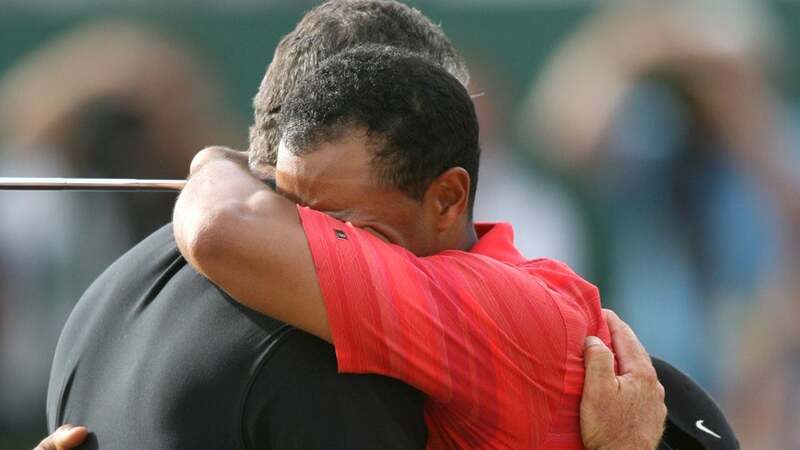 Tiger Woods cries and hugs caddie Steve Williams after winning the British Open on July 23, 2006, at Royal Liverpool. Over 40 days, GOLF.com is rolling out Tiger Woods' 40 biggest moments. Our ranking started on Nov. 21 and will culminate on Dec. 30, which is Tiger's 40th birthday. That's 40 Tiger moments. In 40 days. Ranked. Click here to learn more about our list. A sense of uncertainty hung in the air on the eve of the 2006 Open Championship. There was the venue, England's Royal Liverpool, a.k.a. "Hoylake," which had been absent from the Open rota since 1967. There was the defending champion, Tiger Woods. He entered the event having just missed the first major cut in his professional career at the U.S. Open (courtesy of a pair of 76s), and he was still dealing with the loss of his father in early May. An unusually dry summer had yielded a baked-out course that was playing exceedingly firm and fast. Woods adopted a conservative strategy and stuck to it for 72 holes. He stood one back after the first round, with a five-under 67. It was the only round in which he hit a driver, and he only used it on one hole, missing the fairway at the 16th. He had hit 370-yard drives in practice, but found he couldn't control the ball, so the driver disappeared. His putter was alive and well, as were his long irons. He hit 2-iron off the tee at the par-5 18th, then a 4-iron onto the green from 236 yards to 20 feet. Boom! Eagle. In round 2, Woods chose 2-iron off the tee at the brutal par-4 14th, then hit a drawing 4-iron from 212 yards that bounced several times, clanked the metal flagstick and dropped in. Boom! Eagle. From that point, it was always close, but essentially over. Chris DiMarco clawed to within one on the final nine, but three straight birdies from Woods starting at the 14th sealed the deal. As the fans stood at the last green, Tiger's caddie, Steve Williams, said to him, "This one's for dad." Woods broke down with Williams, and soon after with his wife, Elin. At the trophy ceremony, he told those assembled, "To win my first tournament after my dad passed away, and for it to be a major championship, it makes it that much more special." In a career filled with special moments for Tiger Woods, this one resonated. Check back on GOLF.com every day until Tiger's birthday on Dec. 30 for a new moment in our [email protected] countdown.